If you are interested in experiencing a rainfall-like shower each time you wash up, then perhaps it is time to look into rain shower heads. These types of shower heads can provide you with a spa-like sensation in your own home. There are various of these on the market, however, so to help you find the best rain shower head, we reviewed 10 of the top-selling and high-rated models today. Since rain shower heads can come in an assortment of sizes and styles along with having various features, we looked to include a diverse selection for our countdown. Along with that is a buying guide to provide you with additional advice and tips on how to select the right rain shower head for your needs. Handheld Combo or Single Shower Head? 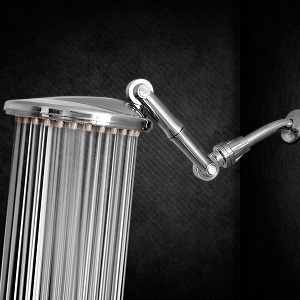 This luxury shower head from SomovWorld is designed for use in either high or low water pressure situations. If you desire it, you can remove the water restrictor so that you can have ultimate water flow. Some users did note though that by removing the restrictor, you may see an increase in how much water is used compared to leaving the restrictor on. Concerning the coverage, this rain shower head provides 6″ worth of it. This may better benefit those who have smaller or medium-sized showers. It is designed with a swivel brass ball joint so that you can adjust the water spray direction to your preferences. As for its appearance, it is made in a contemporary style with a chrome-plated finish over the ABS material. Maintenance is made simple with this rain shower head due to the 90 anti-clogging silicone jets. These help fight against hard water deposits as well as the lime buildup. Lastly, installation is made simple with this model. It is tool-free, and it can connect to most standard shower arms. When you receive the product, you also get a roll of Teflon tape to help with the installation. 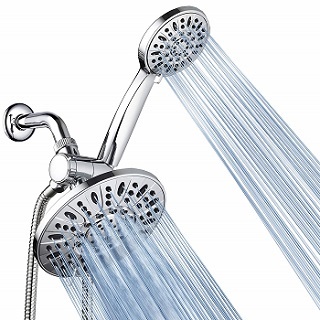 The Hydroluxe Ultra Luxury 2-in-1 Shower Head is one of the most versatile models. With it, you receive five full settings for the shower head and the handheld. The settings are massage, wide rain, water-saving economy rain, stay-warm mist, and pause. Alongside that, there are 24 full and combined water flow patterns you can get to personalize everything. You can use the showers separately or together. The chrome face showerheads are 4″, while the handheld comes with a 5′ flexible hose constructed from stainless steel. It is easy enough to switch between the modes as well by turning the knob on the bracket. When it comes to the flow of water, both should have even rates, but some users mention that one shower head may come out as a trickle. There is more ease of use to be found in cleaning the shower head. As the nozzles are rubber, all that is needed to do is wipe them down. In addition to the cleaning, it is easy to set up the shower head. It features tool-free installation along with conical brass hose nuts that make hand tightening simple. This DreamSpa 3-way shower head comes with a multi-setting handheld combination. Likewise, with other similar combos, you can use the showers together or separately by adjusting the dial on the left side. The shower head chrome faces are different sizes, however. The mounted one is 7″ in diameter, while the handheld is 4″. As for the hose, it is stainless steel, flexible, and reaches a total length of 5″. It features a limited lifetime warranty, which may be to your advantage as some report issues with plastic pieces falling off. There is tool-free installation, and you get everything needed in the packaging such as the washers, water diverter, and Teflon tape. Though the mounted shower head has a single rainfall stream, the handheld shower head features seven settings. These settings include water-saving pause, pulsating massage, power rain, eco rain, rain massage, hydro-mist, and rain mist. Additional features include a patented 3-way water diverter that has an anti-swivel lock nut, an angle-adjustable overhead bracket, 3-zone click lever dial, and rub-clean jets. The AquaDance Premium High Pressure 3-Way shower head may be one of the best shower heads with a handheld combo on the market. To start, it features a 7″ face for the main shower head that provides good coverage, while the handheld comes with a 4″ face. You can use them together or one at the moment. This shower head combo has optimal settings as well. You are able to get 30 settings; there are 12 full and 18 combined water settings in total. There are six full settings: pulsating massage, power rain, rain massage, water-saving pause mode, power mist, and rain mist. It needs a short time or effort to switch between settings. Installing this rain shower head combo is simple too as it is tool-free. The instructions are easy to follow as well to make the setup process more straightforward. As for keeping this clean, it features rub-clean jets. The handheld shower has a 5′ flexible stainless steel hose that has brass nuts for simple tightening. It has a holder, but it doesn’t swivel well, which can make it difficult for some to use. Nevertheless, the overhead bracket is angle-adjustable. 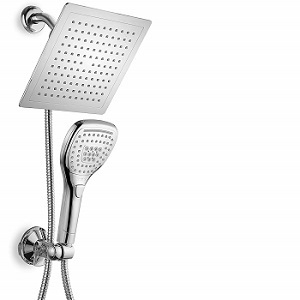 This model from SR SUN RISE may be the best rain shower head with high pressure. What may be even better is that this shower head is designed with air injection technology that offers more pressure without wasting water. More so, there is the air energy technology to offer consistency even if your home naturally has low pressure. If you are seeking a modern look for your bathroom, then this rain shower head with a square face may offer you just that. It has 10-layer chrome to offer it an almost mirror-like finish in addition to stainless steel features such as the filter that helps fight off impurities from entering your water. Some users reach seeing rust over time, however, on the shower head. 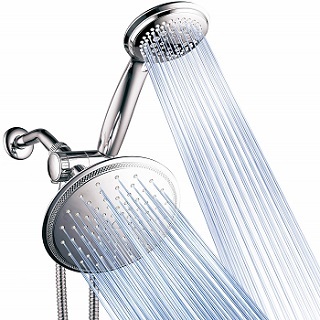 Keeping along with the modern design, this features an ultra-thin shower head body. This also can aid in providing greater water pressure as well. As for the shower head, you can easily adjust it to a more suitable angle. To offer some more advantage to this model, the nozzles are heat-resistant silicone. It aids in cleaning, fights aging, and makes it anti-clogging. With the DreamSpa Ultra-Luxury Rainfall Shower Head, you receive a handheld combo with an elegant design; the mounted shower head is square, while the handheld has a fashionable oval-square design. It is all made in a chrome finish, but there are mentions that the plastic material doesn’t feel as high in quality as it looks. To focus on its layout, the large 9″ main shower head can offer shoulder-to-shoulder coverage. Meanwhile, the 4.75″ handheld face can provide convenient, wide coverage wherever you need it. On the main shower head, you can find rub-clean jets for easier cleaning, and it is even angle-adjustable. The handheld also comes with the rub-clean jets, and it features a stainless steel, flexible hose. In addition, it features push-button flow control to offer one-handed operation. The mounted shower head has a single flow, but the handheld can be used as high-power rain, a waterfall, or an aeration massage. Other features include an angle-adjustable wall bracket for the handheld and a patented 2-way water diverter. The ShowerMaxx Premium Shower Head is another rain shower head that can offer great water pressure. With its 6″ face, you can get decent coverage an overall soothing experience. Sometimes, the pattern is not as wide as it could be though. It has 90 precision-engineered pressure jets as well. The silicone jet nozzles are self-cleaning, and they come with a chrome finish and an ABS frame. This material does feel low-quality though, so there are some questions about how long it may last you. Even still, the company offers a Peace-of-Mind Lifetime Warranty to protect you and your shower head. For water pressure, this is able to provide 2.5 GPM water flow. Of course, the number can change based on your home pressure. No matter, there is a removable flow restrictor that can enhance the water pressure to your liking. 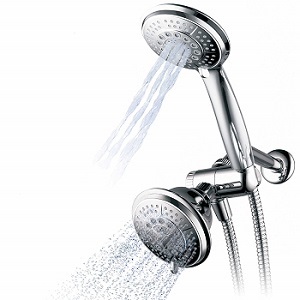 So that you receive water the way you would like it, the shower head has an adjustable ball joint for flexibility. It is easy enough to use as well. Installing this rain shower head is simple as well, and many claims it can be done in around five minutes. WaterPoint’s Rain Shower Head features a sleek design that can fit well in just about any bathroom. It is made from lightweight ABS plastic that has a plated chrome finish. There is also a stainless steel back. However, there are concerns with the durability as it may be too light in weight. There is a lifetime warranty that comes with the shower head though in case of problems. This is easy to adjust as well. This is thanks to the brass swivel ball attached. In addition, it has an 8″ round face that can provide some great coverage for the ultimate spa experience. Installing all of this requires no tools, and it can be done even by those who have never set up a shower head before. For water flow, it appears to be even throughout. It comes with a 2.5 GPM flow restrictor that can be removed, if you wish so that you can have higher pressure. There is little concern about using up too much water as this shower head has an air intake system that injects tiny air bubbles inside the water droplets. By doing this, you can have optimal pressure without wasting water. The HealthyLifeStyle! Shower Head comes in three different designs: white, chrome, and brushed nickel. This way, you can select a shower head closer to your bathroom décor. The round face is 9.5″ in diameter, providing high-quality coverage in a full-spray pattern. There are no tools required to connect this rain shower head either. All that is needed is what is included: sealant tape and the removable water restrictor. Tightening is done by hand so that you can install this in little time. For the ultimate in adjustability, this shower head features a 6-way movement range. No matter who uses the shower, there is an angle that can work for anyone. Position locks automatically as well. The material does not feel as though it will last for years though. It does come with a 10-year limited warranty though, which may provide some peace of mind if something breaks or leaks. There are 109 total nozzles. They are self-cleaning, and they feature anti-clogging silicone jets. This provides easy maintenance in addition to preventing hard water buildup and lime deposits. 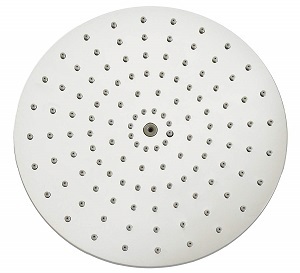 The HotelSpa Rainfall Shower Head is perhaps one of the larger shower heads available with its 10″ square face. It is made from 304 stainless steel material to provide it with greater durability. Something to keep in mind though is that the extension bar can feel less than secure at times when in a locked position. To speak more of the extension arm, it has solid brass construction, and it is both height and angle adjustable. It is easy to tighten the solid brass wing nuts as well so that nearly anyone can use this shower head. This features tool-free installation as well, and it connects to standard overhead shower arms. It has an ultra-thin profile and a high-polish chrome plated finish for seamless integration with your bathroom décor. For keeping it maintained, it has rub-clean jets. 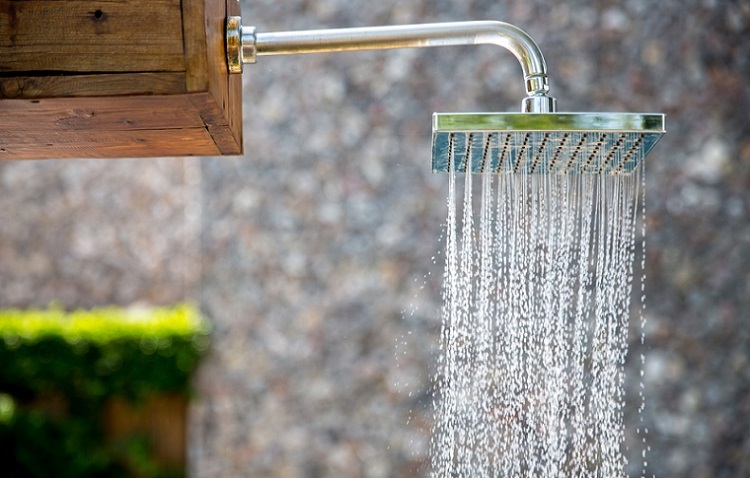 Before you decide on purchasing a rain shower head, there are several features you should keep in mind so that you wind up with the right shower head for your home. When you are shopping for a rainfall shower head, it helps to keep in mind exactly how you want the water to fall in your shower. Do you want to go the traditional route and have the shower head ceiling-mounted? Most rain shower heads are designed for that considering they are meant to deliver water in a “rainfall” fashion. However, there are plenty of wall-mounted rain shower heads that get the job done as well. Also, some showers simply do not have the plumbing fitted to support ceiling-mounted shower heads. You can always re-design your shower entirely to support either design, but it may be more costly. 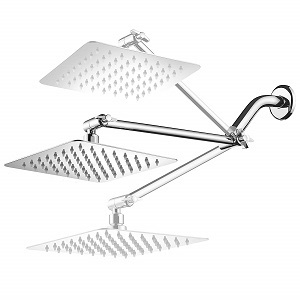 In the end, it is up to you to decide which type of rain shower head interests you more as you can still find quality products designed to be wall or ceiling-mounted. Although rain shower heads are available in a number of different sizes, they can get rather large. For example, you can find some that are 10″ in diameter. Not everyone may have the shower space for larger shower heads. On the other hand, one that is smaller in diameter (e.g. 8″) may not cover adequately in more spacious showers. Another important thing to factor into when selecting the size of your rain shower head is your own height (as well as anyone else who may use the shower). 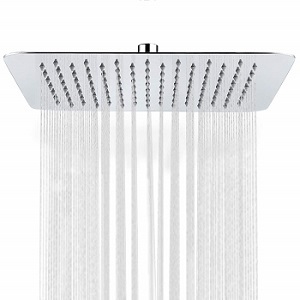 Some large shower heads, for instance, may hang down too low for taller individuals. For these reasons, it is almost vital that you measure your fittings and shower enclosure while keeping in mind the angle and overall size of the rain shower head prior to buying one. 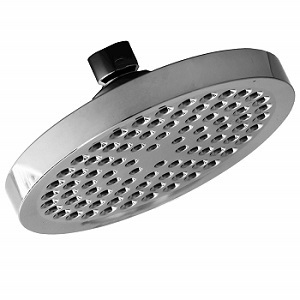 There are many standard rain shower heads that typically deliver high-pressure water in a single spray pattern. If you are looking for something more, you can consider viewing rain shower heads that come with additional settings. Some have five settings—others six or more—that can switch the water pattern to your liking. Generally, you can find rain shower heads with settings such as pulsating massage, power rain, rain mist, water-saving rain, and more. In addition, there are rain shower heads that allow for easy adjustment of the stream flow by simply letting you remove the water restrictor. This may be useful for those who want higher pressure in general. Rain shower heads are designed in many ways beyond being wall-mounted, ceiling-mounted, or available with different water pattern and stream flow settings. Some of the shower heads come with a handheld attached. This option is meant to provide more convenience as you are given full control of where the water hits you. Furthermore, a handheld shower head can help conserve water since you are able to direct it to where you actually need it. This can also benefit households with pets or kids as it can make it easier to bathe them without wasting water. Nonetheless, rain shower heads that have a single shower head function can be appealing still for those looking for simplicity. Who wants to spend hours installing a rain shower head? Many are now designed for simple installation that requires no tools beyond what is provided with the shower head. Of course, if you opt to re-route your plumbing to fit a wall-mounted shower head where you once had a ceiling-mounted shower head (or vice versa), that can prolong the installation process as you would need a plumber. If you are looking for a quick connection, it may be better to consider installing guide that is already designed for your rain shower fittings. Usually, when a shower head is designed for optimal coverage, it may lack a good amount of pressure. The same may be true in many cases if you reverse it: more pressure may equal to less coverage overall. Knowing this may better help you decide on a rain shower head like those of you looking for the high-pressure flow will enjoy the simple shower heads, typically ceiling-mounted, over ones with handheld combos that provide greater coverage with slightly less stream flow pressure. The previous buying guide section touched on how height and size play a factor when selecting a rain shower head. Thankfully, there are lots of choices available that you can adjust. Some even grant the ability to adjust the overall height in addition to changing the angle. These types of options can benefit those of you who have multiple people using the same shower. While researching for rain shower heads, it can be a good idea to check out the material it is made from. Most are made from ABS material and usually have a chrome finish with a stainless steel backing. This can make the product more lightweight while still retaining longevity. Others have a completely stainless steel construction for ultimate durability. Checking that your rain shower head is made from quality materials can ensure that it will last you a good amount of time. Of course, it is important to think about size and quality when selecting a rain shower head, but the appearance is a necessary feature to address as well. Many rain shower heads take a more elegant, stylish approach in addition to functionality. Some even give finish options beyond the typically chrome-like design, coming in finishes such as bronze. 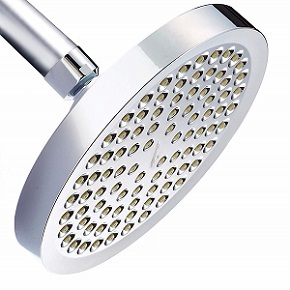 There are rain shower heads that have a more square appearance rather than the standard round design too. Consider the mood you wish to convey as well as your current bathroom décor to better help you decide on a type of rain shower head. With the top 10 models reviewed above, you should have no problem finding the best rain shower head for your home. The AquaDance 7″ Premium Rainfall Shower Combo may make for the best handheld combination shower head due to the 30 settings available, while the SR SUN RISE Luxury Square Shower Head is one of the best rain shower head with high pressure available. No matter what you decide, you are sure to experience the luxurious spa-like sensation only a rainfall showerhead can provide.